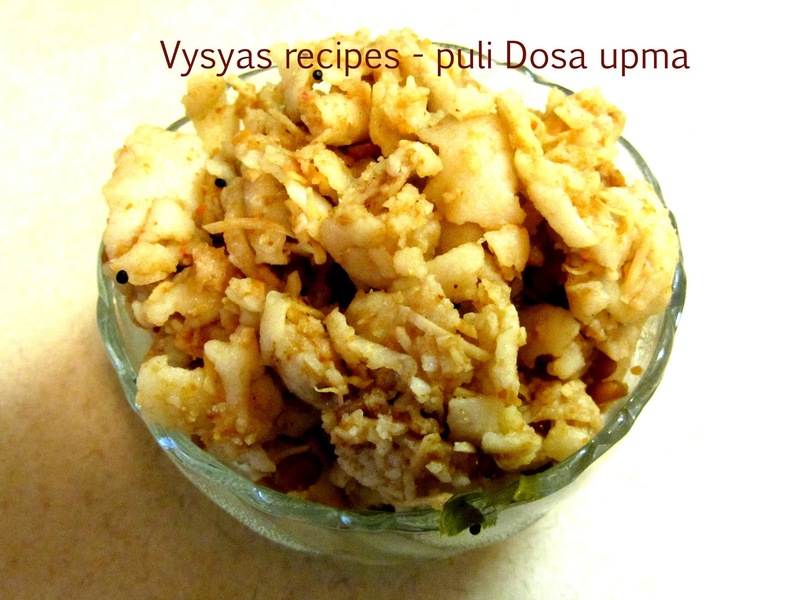 Dosa upma or Pappu Rotta is one of authentic Vysyas recipes.Dosa Upma prepared from soft lacy dosa tastes yummilicious. 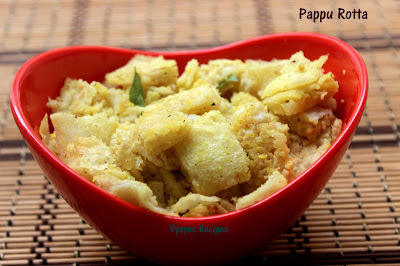 In coimbatore many hotels sells this recipe and makes a great business.you can prepare it with left over Neer dosa recipe or Kodo Millet Neer Dosa also ,else you can follow the below procedure to make Pappu Rotta. toor dal - 3 tablespoon. Green chillies or Red chillies - 4.
curry leaves - 10 leaves. Soak Raw Rice for 2 hours & grind into smooth paste with coconut, needed salt & water & transfer it to vessel. wash the Mixie or Grinder with 2 cups of water, & transfer it to a Pan, & cook till it gets Porridge Consistency,then transfer it to vessel that has batter. Give a quick mix. Add needed water & bring it to Rava dosa batter consistency. Heat the tawa, when it is hot, take the batter,in ladle and spread it in outer corners of tawa. Drizzle some oil, when it is cooked and lightly turns crisp at the edges, just flip the dosa.Remove from tawa, when both sides are cooked. Pressure cook toor dal with 1/4 tsp of turmeric. Chop dosa's into small pieces . (By using cutter or knife you can chop 10 dosa's within 5 to 10 min.) keep the chopped Dosa's aside). Now basic Rotta preparation is Ready. Add oil in a pan , add mustard seeds,when it splutters add channa dal, urad dal,red chilies, curry leaves . when water starts boiling, add dosa pieces, salt(adjust) ,mix well.Now Pappu Rotta is Ready. Please also check other two varieties, for different taste. Coconut Grated - 3 tbsp. Heat the oil in a kadai, add tempering items, when dals turns golden brown colour, add tamarind extract with 1/4 cup of water , add idli podi , then add grated coconut, when water starts boiling add dosa upma and salt, then mix well.Now tamarind dosa upma is ready. 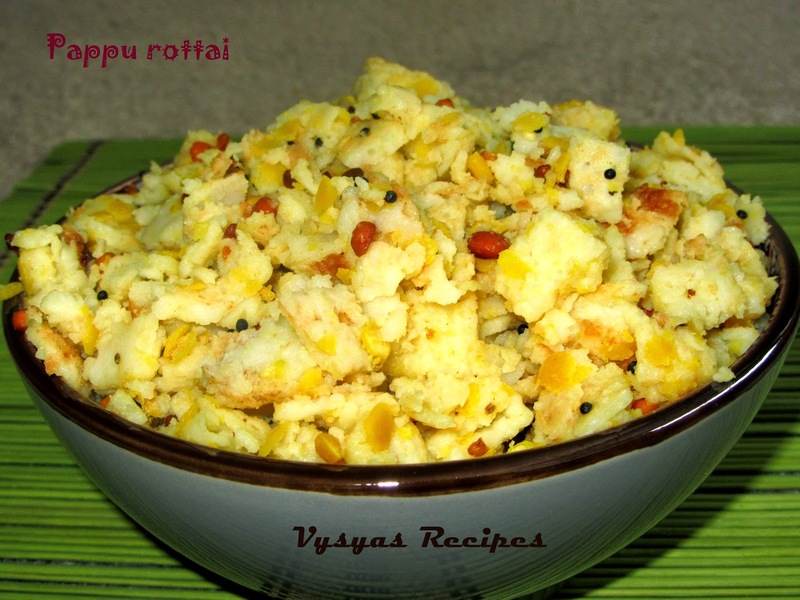 A new & delicious Upma..........very nice presentation. i heard it first time!! nice recipe! !Feel like eating it right away!! i will definitely give it a try!! 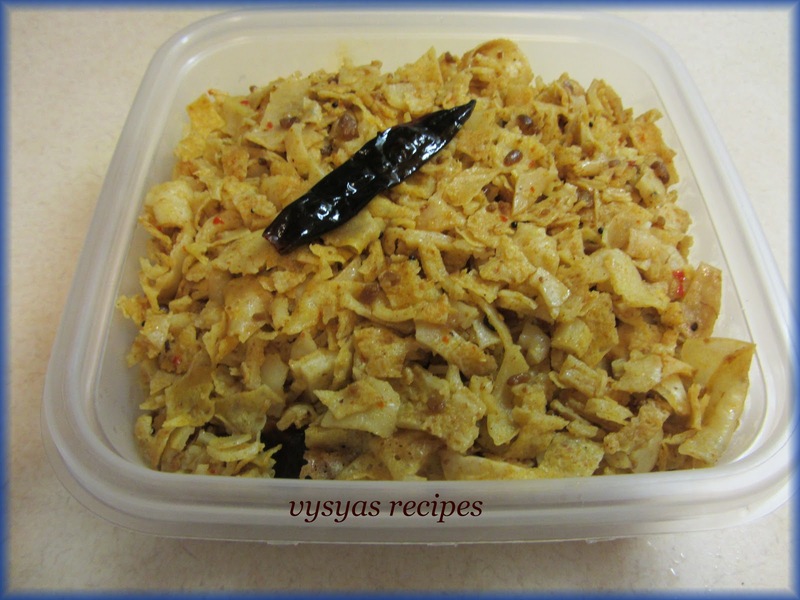 This is a traditional vysya recipe! Very delicious! Can make sweet ones too by mixing jaggery/sugar, coconut and seasoning with cashew and cardamoms!